A simple Healthy Afternoon Snack. I'm back and finally I can post something out after few days being quit because I was running out of ST, Lol. I had a problem replying comments, I've got the notifications that my ST was low. I was like.. like..."what a h**l is the ST?" Lol, funny! I blamed my wifi connections, and asked my husband to call the provider to fix the internet and changed the modem. And he did! well, is not all my fault who doesn't really understand yet about the Steemit, Lol. It happened that my wifi connections wasn't so good for the last 2 weeks. And today the guy came to change my modem, and my wifi is working perfectly good. I'm so happy about it. Anyways, forget about my wifi problem, it's all done. Back to my story about ST, I figured that out by asking my friend about it. From there, I learn how to manage ST properly. so, as my wifi connections is working good and I have enough ST to post, Today I'm gonna share my simple afternoon snack. You know, sometimes, we take the simplest things for granted...But simple is best!! BUT, is so incredibly energizing, detoxifying, and hydrating all in one! 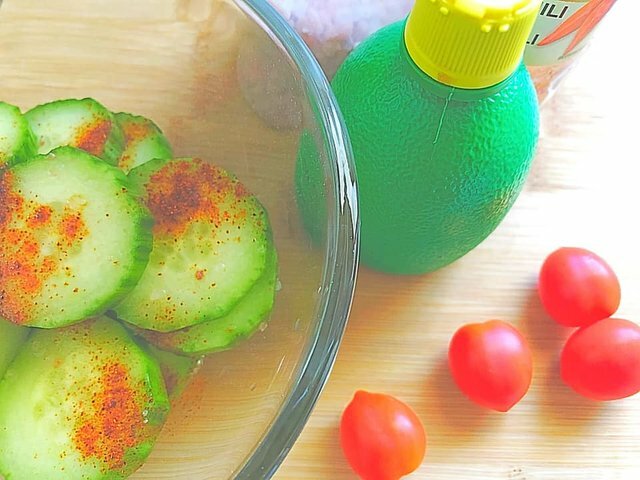 Just slice 1 fresh cucumber, sprinkle with lime juice, pink salt, and chili powder. That's it. Try it, and you won't need your afternoon caffeine! !